CLAIM: The piano seen behind Queen Elizabeth during her Christmas speech had been stolen from Saddam Hussein’s palace. 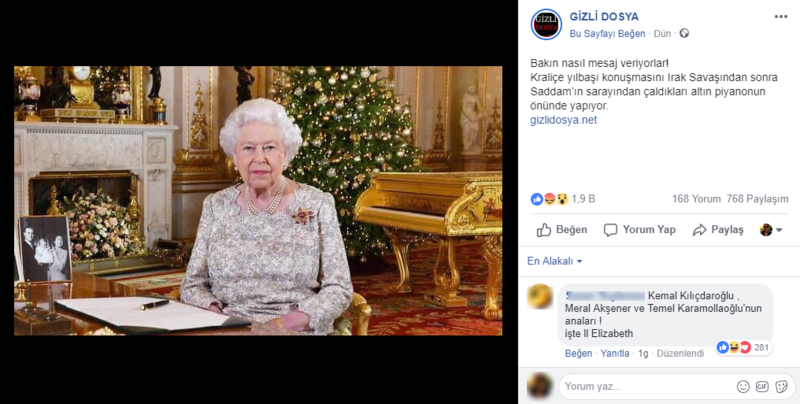 It was claimed in a photo which was shared on social media and sent to teyit.org that the golden piano in the room where Queen Elizabeth made the Christmas speech was stolen from Saddam Hussein’s palace after the Iraq War, and that the Queen spoke in front of the piano intentionally. The photo which was shared on a page named “Gizli Dosya” (Secret File) on December 30, 2018 was shared 767 times and received 1,900 likes. The photo shared by Serkan İnci on Twitter was liked by 4,549 users and retweeted 1,306 times. The tweet of another Twitter account was shown as the source of the photo. This photo got 1,833 likes and 1,243 retweets, respectively. 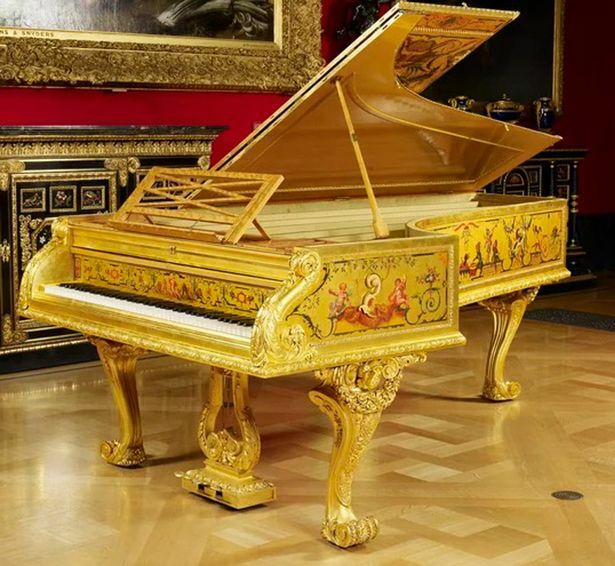 Nevertheless, the claim that the piano seen behind Queen Elizabeth was brought to Buckingham Palace from Saddam Hussein’s palace after the Iraq War is false. Queen Victoria had the piano built for Buckingham Palace in 1856. The claim was first made by a parody account. It can be found out that the golden piano seen behind Queen Elizabeth during her speech was specially designed for Queen Victoria in 1856 by S & P Erard. Detailed information about the piano is available on the official website of the Royal Collection Trust. The video above provides comprehensive information about the piano in Buckingham Palace. It is stated that the piano which was designed for Queen Victoria in France in 1856 has been kept in the palace since then. The piano seen in the photo was specifically decorated for Queen Victoria and Prince Albert in the Victorian era (1837-1901). Based on the sources, it can be said that Queen Victoria and Prince Albert were playing piano together and they had a piano in each residences they lived. Besides, they were performing overture and symphonies. This instrument which was designed and built in 1856 was used as a showpiece for the State Roms at the palace. It is revealed that the piano was not made of gold. Instead, it was painted in gold. According to several posts on social media and some of the opinion columns published in the UK, Queen of Elizabeth was criticized for making the Christmas speech in front of the golden piano. However, none of these criticisms claim that the piano was stolen from Saddam Hussein’s palace. The users criticize that piano is a sign of vanity and Queen should not show such luxury in the presence of many homeless people. 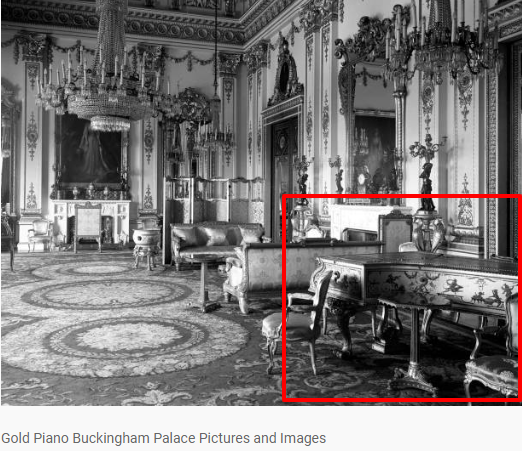 A photo which was reported to be taken between 1940 and 1949 shows the piano inside the palace. 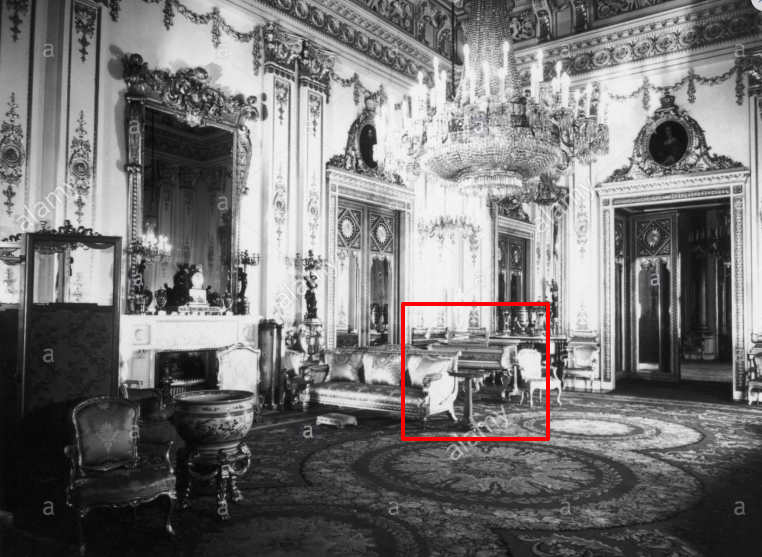 It can be seen in another photo above taken in 1960 that “The White Drawing Room” of the Palace was furnished with the piano. The claim was first shared on Twitter by a parody account named “Jackie Bird.” It can be understood that the account belongs to a humor page. The claim was posted for fun upon the debates which started after Queen’s Christmas speech. 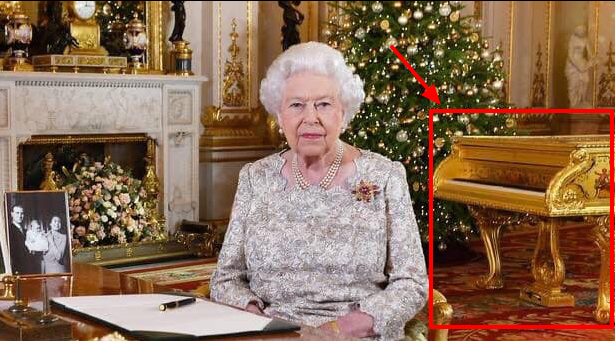 In conclusion, the claim that the piano seen behind Queen Elizabeth during her Christmas speech in the video was made of gold and brought to Buckingham Palace from Saddam Hussein’s palace after the Iraq War is false. The relevant piano was designed for Queen Victoria in 1856 and has been kept at Buckingham Palace since then. She is a Sociology and History of Philosophy student at Middle East Technical University. She participated Erasmus program as Frankfurt Goethe University Sociology Student for one semester in 2017 Spring and applied a field research on migrant workers there. Her academic interests are media, art theory and sociology of knowledge. During her undergraduate program, she took photography, new media, programming language, project writing and German language trainings. Since 2016, she works as a Student Assistant at Middle East Technical University Sociology Department. She is interested in amateur photography for six years. Bu arma, teyit.org’un organizasyonel ve editoryal süreçlerinin Uluslararası Doğruluk Kontrolü Ağı’nın prensipleriyle uyuştuğunu göstermektedir. 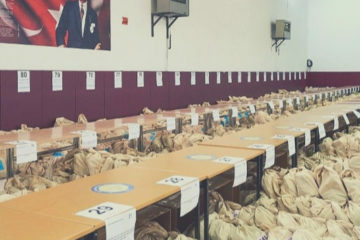 teyit.org, çalışmalarında tarafsız olduğunu, hakkaniyetli davrandığını, kaynaklarının, finansal yapısının ve organizasyonunun şeffaf olduğunu, metodolojisinin herkese açık şekilde paylaşıldığını ve düzeltme politikasını yayımladığını Ağ’ın yönetim kuruluna ve bağımsız değerlendiriciye ispat ederek İlkeler Kılavuzu’nun imzacısı olmaya ve bu armayı sitesine yerleştirmeye hak kazanmıştır. 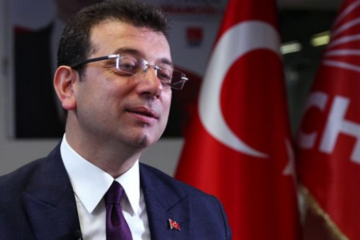 teyit.org is an independent fact-checking organization based in Turkey. 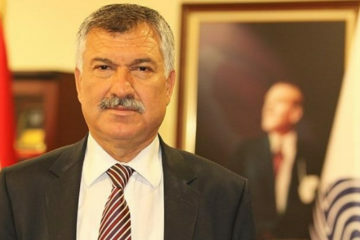 © 2016 teyit.org, Her Hakkı Saklıdır.